The new Renault Clio will be launched at the forthcoming Geneva Motor Show, and Renault says this opens a fresh chapter in the Clio epic that began in 1990. The carmaker claims the new Clio features the same dynamic cues as those which have become the hallmarks of the new Megane's frontal design. The new Clio sits squarely on the road and boasts revised styling, with the lines of the new headlamps now extending to the lateral upturns of the front air intake. The broad grille in the lower part of the new front bumper sets off the dynamic styling with the presence of gloss black protective mouldings. The revised design of the rear lights extends the waist line across the hatch, while the uncluttered approach to the design of the central part of the rear bumper further emphasises new Clio's dynamic stance. The reversing lights and foglamps are positioned low down and to the extreme corners of the rear bumper. Renault says the choice of the new interior trims and equipment aims to produce a sense of well-being and quality. 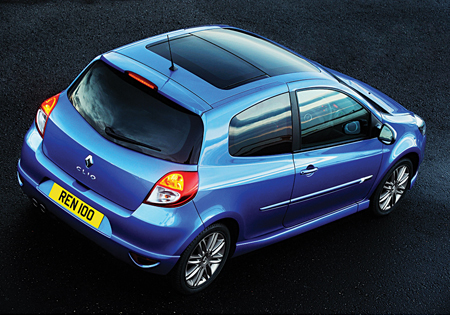 As with other Renault models, a new GT version forms part of the new Clio range. More details on the new Clio after the Geneva Motor Show and before it goes on sale here in the summer.